-Comparing with metallic product, this pan offers you less oxidation, quality alteration and metallic solution. -This product does not smell metal and extracts the natural taste and sweetness of materials to make mild and healthy food. -This product is of easy handling and useful thanks to small and light body with lid. -This product is capable for the multiple uses, such as preparation of small quantity of meal and rice porridge, roasting by water, parching sesame, cooking soy bean soup and other soups including noodle soup and so on. -Recommended by Prof. Hikari Ogata of Lima Cooking School. 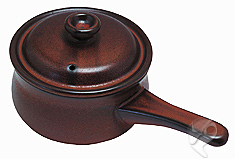 -Made of Heat-resisting Ceramics of for Gas Direct Heating.